Apr 18, 2018 Jim O'Neill assesses the economic potential of the bloc of countries coming in the wake of the BRICs. The article needs a definition of how to measure productivity and compare different countries. The UK has a large tranche of low wage, low taxed jobs, which are thought to have 'low' productivity. If such largely minimum wage jobs were to be paid more, those workers would in money terms be more productive. Meanwhile, in countries like France or Belgium, they have a large tranche of low wage, high taxed jobs, for which employers have to invest in more productive ways of working - simply to be able to pay the taxes. If those taxes were to be increased, there would necessarily be an increase in productivity for the people remaining in work. These countries also have bigger public sectors and more people on more generous benefits of different kinds. How to compare productivity levels between countries, unless you divide your 'total' output by a count of all the people who are supported by that 'total', including those who incomes are funded by the taxes paid ? Secondly, what do you include in the 'total' output ? If it is the private sector, normally one can start by using the money value added. But in the public sector, what value to put on public goods? The clean air, health service, climate management, better benefits, flood prevention, easy public transport, uncongested roads, decent infrastructure, civil and national protection, etc; even add a measure of happiness of the population, give a value to the unpaid private contributions to community activity and evaluate what it means to have a more equal society. The whole exercise is vastly richer and much more complex than the monetary GDP changes attributable to private sector productivity, plus increases in the working population. It is too narrow a focus to ignore the public goods which do not currently show up in GDP stats. 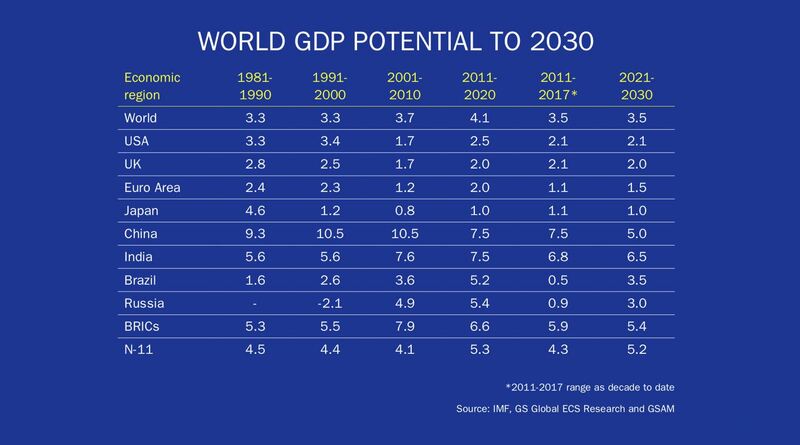 For example, Mr O'Neill mentions India as a possible star GDP player in the next decade. The air pollution and the congestion of Indian cities are already far beyond crisis... If the families of 4 or 5 in Delhi breathing in the dust on their scooters would all have cars, the GDP would certainly increase and the city would be even more congested and polluted. How to say that India will have a larger economy than Germany by 2025, without considering the relative value of the conditions in which people live ? Indeed economics needs the social sciences. The subject is economic growth, period, so what I say is perhaps irrelevant. But I can't help noticing the absence of any reference to (i) the fact that what is today called "the economy" is largely based on the incessant generation of artificial demand, i.e. on superfluous production and consumption, (ii) the fact that a steady increase in the generation of greenhouse gases is in consequence little short of inevitable, and (iii) the fact that the continuation of economic growth will conceivably lead within decades to ecological catastrophe. Given the fiscal deficit spending, debt growth and monetary stimulus of the last 20 years it would appear our next period of growth will require MMT. How can one talk about future trajectories without consideration of investments in infrastructure and human capital, which are the foundations of an economy? America has the largest infrastructure deficit of any country, by a why margin, and it imposes a $600 billion annual tax--and it is getting steadily worse. America has dramatically cut its public sector investments in human capital, whether in basic research or education--and has fallen from 1st to 19th on college graduation; much further in STEM. Of course such investments may also provide a Keynesian stimulus--raising short-run performance even while building the basis for stronger long-run growth. America has been disinvesting in its future--that surely should play into these projections. During XXth century, Large gains in productivity were achieved through leveraging capex. No longer. Nowadays large gains in productivity come only from labor cost arbitraging and internal devaluations (of wage costs). Thus India could in theory hope for rosy days to come pretty soon, should the country enter the fray of labor cost arbitraging big time. But there is a catch here. Former Western gains in productivity were shifted to China. Indeed the transfer was operated out of countries very far away from China, making military conflict a non starter between economic rivals. But what if India succeeded in grabbing such gains out of China? Would the angry masses of newly unemployed Chinese workers look dumb like most Europeans did at their time? There are 30% more men than women in China. See the military implications of such an excess of idle testosterone? But it ain't that straight a line for India, a country where religion dominates society. History shows that countries/societies that have performed giant economic leaps forward were not dominated by religion. In India's case, it's about thousands of different religions at the same time. And last but not least, history is stubborn in proving tirelessly that when a country becomes a growth miracle, its population jump into a foolish spending spree, and postpone saving for a later date. However, India is already a country of savers. They earn very little. But they save most of it. Adding insult to injury to the globalists, Indians save mostly in physical gold, so they do not recycle their financial reserves back into the financial system. As of today, India's trade deficit occurs because of gold imports to satisfy physical demand, whatever the higher taxes Modi imposes. Chinese recycle back their wages into consumption or into the financial system. So the monetary flow is constant. Indians wouldn't. See what I mean? Religion may matter more than anticipated. One more thing. Guess what impact an Indian miracle would have in the price of industrial commodities. Simply put, China will not allow the Indian miracle to happen. "For overall growth to continue, productivity must improve." But only when costs increase as a result of higher productivity, ie, labor costs increase and consumer spending costs increase. GDP is, a measure of cost. The cost of all production, plus the costs paid by all consumers/customers. While unit costs, say of labor, might fall, in isolation this will cut GDP. Eg, the unit labor cost in capital and operations for each Big Mac might be cut in half, GDP will go down if the price is cut in half, even if the population eats 75% more Big Macs and gets fatter than they already are. For most essential consumption goods in developed nations, the costs/prices and supply/demand quantities are in excess of that needed for a "good life". Ie, very few in the US need more calories, more clothing, more entertainment (TV, gaming, social media), or more housing for 90% plus. While 10%-20% of the population lack good housing, this is a consequence of too little "government" costs, like taxes to pay more workers to build roads, water&sewer, schools, public transport, and all the complements housing needs to be useful to those with work opportunities. This higher cost in the post WWII era enable the housing boom that created the American Dream of a single family home with land for a garden or the kids to play. The irony in the US is housing being abandoned in much of the US with low living costs, driven by cost cutting resulting from higher productivity for goods that are already supplied in excess. Food, for example, produced with much higher productivity in the rural America heartland. Farming requires far fewer workers, and in many cases the rural manufacturing has been bought out by bigger firms operating in urban areas in larger factories with lower costs due to greater economies of scale. Again, economies are zero sum. Cut costs of production in a region and workers have less income to spend, which cuts business revenue. Profits are the money not paid to workers who spend the money buying production. Profits increasingly leave the community where workers are a labor cost who pay the cost of consumption. Capital costs are the labor costs of factories, production equipment, worker skills, etc. Increasingly production equipment production is mobile, so expensive parts of modern factories can be produced in Germany, New England, Japan, etc, by very costly engineers, technicians, machinists, etc. These workers are increasingly concentrated in high cost regions where public policy supports high cost education and research, as well as costly public activities like recreation, entertainment, social life which pays lots of workers who spend all income paying high living costs. Note, in high cost regions, food is produced at lower producctivity thann in low cost regions. Ie, food is consumed at sit down restaurants with high cost per calorie instead at fast food or cooked at home or just eaten out of a bag with lower cost per calorie. China leads in growth because its public policy is to increase living costs, and also lower productivity for such things as food. Calories cost more to consumers as China shifts from mostly plant calories to more animal calories. Housing costs are increasing as its productivit goes down, ie, the farmer living spaces with production and shelter for animals and other production are replaced wth larger urban building spaces used only for living space, not production. This shift requires more public asset investment than is done in rural economies, thus inherently lower productivity for basic living consumption. But this investment enables much more complex production of goods and services. Like emergency services for injuries. The productivity of treating acccident victimms in cities, say people in road accidents, is much higher in high costs areas than for farm accident victims in rural areas. The low productivity of a trauma center in the rural area means the trama center is never built, or is closed. In the US, hospitals are being closed in rural areas because they can't compete with higher productivity hospitals in high cost urban areas. Zero sum. Growth requires high costs! Higher productivity spurs growth only if it increases total costs to the economy.